MCE first began serving Contra Costa in 2013, when the City of Richmond voted to join. In 2015, the neighboring cities of El Cerrito and San Pablo voted to join. Then, in 2016 the cities of Lafayette and Walnut Creek voted to join, making them the first cities outside of District One (West Contra Costa County) to have Community Choice Aggregation (CCA) service. Unincorporated Contra Costa County and the 14 cities without CCA service began investigating their options in 2015. The County authorized staff to conduct outreach and explore the formation of a separate CCA. Staff began outreach by hosting three community workshops in Hercules, Brentwood, and Walnut Creek in late 2015. In March 2016, the Contra Costa Board of Supervisors voted to work with interested incorporated areas to obtain electrical load data from PG&E in order to conduct a technical study to consider their different Community Choice options. This technical study weighed the risks and opportunities to join MCE, join Alameda County’s forming CCA called East Bay Community Energy (EBCE), or to start a new Contra Costa CCA program. Incorporated Contra Costa communities also began discussing their CCA options, requesting presentations, convening subcommittees, and even forming citizen advisory committees to explore their options. In 2017, the Town Council of Moraga was the first Contra Costa community to vote to join MCE, on April 26th. Then, on May 2nd the Contra Costa Board of Supervisors and the Town Council of Danville voted to join MCE. The Oakley City Council voted on May 9th, Pittsburg City Council voted on May 15th, Pinole City Council voted on June 6th, Concord City Council on May 23rd, Martinez City Council on June 7th and San Ramon City Council voted on June 26th. These votes authorized the completion of MCE’s membership application, which includes a resolution, memorandum of understanding, and an ordinance requesting to join. MCE’s Board of Directors reviewed the membership applications of these nine interested jurisdictions on June 20, 2017 and voted to extend membership to all applicants. 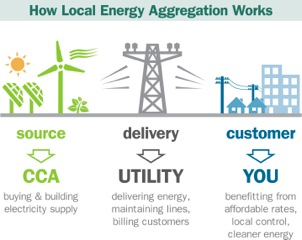 Community Choice Aggregation (CCA) is a program that enables local governments to aggregate electricity demand within their jurisdictions in order to procure electricity for its customers while maintaining the existing electricity provider, Pacific Gas & Electric Company, for customer billing, transmission and distribution services. The State of California passed legislation in 2002 (Assembly Bill 117) that permits local agencies to form CCA programs for their communities. This webpage is intended as an information hub for interested citizens, businesses and other City organizations, providing updates on the City’s interest in joining a CCA program, and to notify citizens of the many opportunities to participate in the process. We welcome your participation and input! By the end of 2014, CCAs were serving nearly five percent of Americans in over 1,300 municipalities in 7 States, including California. CCAs offer local governments the opportunity to aggregate regional energy demand, set local energy goals, develop energy efficiency and demand reduction programs, and negotiate directly with energy suppliers and developers rather than the traditional utility business model that relies more heavily on fossil fuels. For more information about CCA in California and how it works, see our Frequently Asked Questions. You will find links to both the MCE and PG&E websites that provide information about going Solar. MCE has created a solar website to assist customers with questions and to provide information relating to their solar program and how it compares to the program PG&E offers. PG&E also offers a similar website that provides information about the benefits of Solar.